There used to be a time when we didn’t have to worry very much about the safety of the mail in our mailboxes. Everyone knew it was a federal crime to steal mail, so they tended to avoid the temptation. Unfortunately, those days are now in the past and people today do not give a second thought to taking things out of people’s mailboxes in an effort to obtain personal information and engage in identity theft. In addition to identity theft, an unsecured mailbox opens the potential for theft of credit cards and checks. While these last acts are not always in combination with identity theft, they are still acts of fraud and forgery as well as an inconvenience for the person against whom the crimes are committed. If you want to prevent being a victim of fraud, identity theft or forgery, it’s vital you act proactively instead of simply ignoring the problem of mail crimes occurring in every neighborhood in America. This is true of both residential mail customers and commercial mail customers. Taking action to ensure your mail and identity are safe is important, as homeowners cannot assume their mail will be safe in their mailbox during the day or night. If a thief feels as if they can secretly gain something from your mail, they will take it without worrying about the consequences. They think with no logical morals, which is why they are considered “criminals” in the first place. Even though the possibility of mail theft is very possible, it’s important to remember you are in control and locking mailboxes can help you prevent mail theft in your own home or business. While there will always be those who can break into anything, no matter how secure it may be, the truth is thieves are usually looking for an easy entry. They don’t want to have to take the time to break a combination or cut off a padlock. This is because the more time they spend trying to get into the mailbox, the better the chances are they will be seen. In today’s age of video surveillance cameras they are taking a chance as it is, but if they take time to break into a mailbox, the more likely it will be for them to be seen on surveillance equipment thus alerting someone in the building to their presence. When you are wise enough to use a locked or secured mailbox, you can feel safe knowing your mail is safe and sound until you get the chance to retrieve it. Criminals simply don’t want to fuss with a difficult to open mailbox which is why secured mailboxes are so effective in deterring mail theft crimes from occurring. Remember, before you purchase a locking mailbox you need to be sure it’s USPS approved. 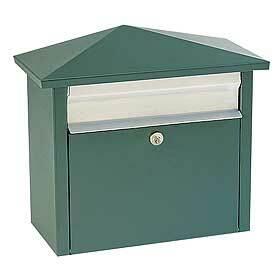 You will be able to find many different styles and designs of secured mailboxes, for both the home and businesses.